But we, after we have thus washed him who has been convinced and has assented to our teaching, bring him to the place where those who are called brethren are assembled, in order that we may offer hearty prayers in common for ourselves and for the illumined person, and for all others in every place, that we may be counted worthy, now that we have learned the truth, by our works also to be found good citizens and keepers of the commandments, so that we may be saved with an everlasting salvation. Having ended the prayers, we salute one another with a kiss. There is then brought to the president of the brethren bread and a cup of wine mixed with water; and he taking them, gives praise and glory to the Father of the universe, through the name of the Son and of the Holy Ghost, and offers thanks at considerable length for our being counted worthy to receive these things at His hands. And when he has concluded the prayers and thanksgivings, all the people present express their assent by saying: "Amen!". This word Amen answers in the Hebrew language to genoito [so be it]. And when the president has given thanks, and all the people have expressed their assent, those who are called by us deacons give to each of those present to partake of the bread and wine mixed with water over which the thanksgiving was pronounced, and to those who are absent they carry away a portion. 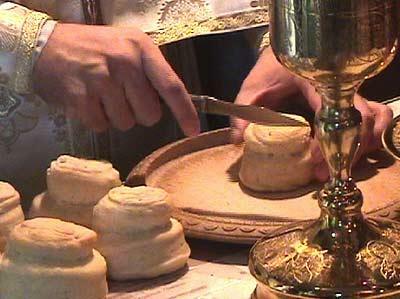 And this food is called among us ukaristia [the Eucharist], of which no one is allowed to partake but the man who believes that the things which we teach are true, and who has been washed with the washing that is for the remission of sins, and unto regeneration, and who is so living as Christ has enjoined. For not as common bread and common drink do we receive these; but in like manner as Jesus Christ our Saviour, having been made flesh by the Word of God, had both flesh and blood for our salvation, so likewise have we been taught that the food which is blessed by the prayer of His word, and from which our blood and flesh by transmutation are nourished, is the flesh and blood of that Jesus who was made flesh. For the Apostles, in the memoirs composed by them, which are called Gospels, have thus delivered unto us what was enjoined upon them; that Jesus took bread, and when He had given thanks, said, "This do ye in remembrance of Me, this is My body;" and that, after the same manner, having taken the cup and given thanks, He said, "This is My blood;" and gave it to them alone. Which the wicked devils have imitated in the mysteries of Mithras, commanding the same thing to be done. For, that bread and a cup of water are placed with certain incantations in the mystic rites of one who is being initiated, you either know or can learn. And we afterwards continually remind each other of these things. And the wealthy among us help the needy; and we always keep together; and for all things wherewith we are supplied, we bless the Maker of all through His Son Jesus Christ, and through the Holy Ghost. And on the day called Sunday, all who live in cities or in the country gather together to one place, and the memoirs of the apostles or the writings of the prophets are read, as long as time permits; then, when the reader has ceased, the president verbally instructs, and exhorts to the imitation of these good things. Then we all rise together and pray, and, as we before said, when our prayer is ended, bread and wine and water are brought, and the president in like manner offers prayers and thanksgivings, according to his ability, and the people assent, saying Amen; and there is a distribution to each, and a participation of that over which thanks have been given, and to those who are absent a portion is sent by the deacons. And they who are well to do, and willing, give what each thinks fit; and what is collected is deposited with the president, who succours the orphans and widows and those who, through sickness or any other cause, are in want, and those who are in bonds and the strangers sojourning among us, and in a word takes care of all who are in need. But Sunday is the day on which we all hold our common assembly, because it is the first day on which God, having wrought a change in the darkness and matter, made the world; and Jesus Christ our Saviour on the same day rose from the dead. For He was crucified on the day before that of Saturn (Saturday); and on the day after that of Saturn, which is the day of the Sun, having appeared to His apostles and disciples, He taught them these things, which we have submitted to you also for your consideration. The shape of the Eucharistic worship as described by St Justin can be seen in all rites of the Church today. The Liturgy, of course, developed and evolved differently in different times and places, over the centuries, and our parish worships according to the Eastern Rite of Orthodoxy, using such liturgies as the Divine Liturgies of St John Chrysostom, St Basil the Great and, occasionally, St James of Jerusalem. There are also Orthodox parishes, monasteries, and missions which worship according to the Western Rite, using liturgies which follow the customs, traditions and spirituality which developed in Orthodox Western Europe and the British Isles prior to the Schism of the 11th and 12th centuries. Below is the basic outline of the Liturgies of Ss Basil and John Chrysostom, which we use most frequently. Blessed is the Kingdom of the Father and of the Son and of the Holy Spirit, now and ever and unto the ages of ages! Amen. With these words, which are an ideal summary of the purpose of our gathering, we begin the Divine Liturgy, declaring our Faith in the Most Holy Trinity, which permeates the entire Liturgy. Also known as the Litany of Peace, this Litany begins almost every service in the Eastern Rite of the Orthodox Church. In it, we pray for the peace of the world, the Church, and for all people. In the early days of the Liturgy, the bishop, priests, deacons and servers would make their way into the altar from a separate vesting room in a magnificent procession. The Antiphons were sung during this procession, calling the minds and hearts of the faithful to the worship of God. Over time, this evolved into a very short procession through the midst of the faithful and, in present times, the Antiphons are often shortened in some churches, and occasionally even omitted altogether. In our tradition, we use them in their entirety. On Sundays, the First Antiphon is usually Psalm 102 (Bless the Lord, O my soul...). Then follows the Small Litany and then the Second Antiphon (usually Psalm 145). Another short Litany follows, and finally, the Third Antiphon (The Beatitudes). The antiphons vary on weekdays and certain feast days. Traditionally, the procession would then end with the Little Entrance. The Little Entrance is all that remains today of the great procession, and is the entrance of the clergy and other servers into the altar. Current practice is for the Liturgy to begin with the clergy and servers already in the altar so they now process out by the north deacon's door in a circular motion and enter again by various doors, carrying the Gospel Book through the midst of the faithful. Something closer to the earlier form is used when a bishop serves. During this time, the Troparia and Kontakia are sung. These are the appointed entrance hymns of the day, and are usually in honour of Our Lord, the Mother of God, the Patron Saints of the parish and any Feast that may fall on the day. Having come before God in worship and the clergy having entered the Holy of Holies, we sing this hymn in honour of the Holy Trinity which is reminiscnet of the hymn of the prophet Isaiah's vision of heaven. Trisagion literaly means thrice-holy (tri = three, agios = holy). Holy God, Holy Mighty, Holy Immortal, have mercy upon us! The Readings from Holy Scripture follow here. The Prokeimenon is sung by the Reader, and is a short responsory of Psalm verses. The Subdeacon or Reader then chants the Epistle or a portion of the Acts of the Apostles. After this follows the Alleluia and the proclamation of the Gospel. We all sit for a brief homily, explaining the scriptures in the light of the Church's teaching, and exploring their application to our everyday lives. We now sing the Augmented Litany, also called the Litany of Fervent Supplication, in which we pray again for the world, the Church, all people of various conditions, and specifically, by name, those who have specific needs and for whom we have been asked to pray. The Litany for the Departed is then sung but is omitted on Sundays and Feasts. Then follows the Litany for the Catechumens, in which we pray for the Light of the Holy Spirit to guide those who are seeking the Truth of Orthodoxy, and specifically, by name, those from our own community who have begun the path towards illumination, and are preparing for Baptism and Chrismation. This ends the portion of the Liturgy known as the Liturgy of the Catechumens, and begins the Liturgy of the Faithful. This is the Eucharistic section of the Liturgy, during which Christ comes to us in his Body and Blood, and properly is the action of the baptised people of God, those who have been grafted into Christ's mystical Body and are of "one heart and one mind". Traditionally all present would have been initiated into the Mysteries through preparation, Baptism, and Chrismation. In modern practice, visitors and enquirers are often permitted to stay for pastoral reasons. 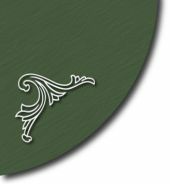 However, those catechumens who have taken the decision to embrace Orthodoxy are dismissed at this point, in order to strengthen their understanding of, and submission to, the Faith that they have adopted. The short Litanies of the Faithful then follow. We who, in a mystery, represent the Cherubim, and join with them singing the thrice-holy hymn to the life-giving Trinity, let us now lay aside all the cares of this life, to receive the King of All, invisibly escorted by the ranks of Angels. Alleluia! Alleluia! Alleluia! The Litany of Oblation follows, in which we ask for the blessings of God. This is the great affirmation and confession of the divinely-revealed core tenets of the Holy Christian Faith into which we are baptised. (See the note at the bottom of the page). At our church, we chant this with great gusto and bells are rung. -in the Holy Spirit, the Lord, the Giver of life; Who proceedeth from the Father; Who with the Father and the Son together is worshipped and glorified; Who spoke by the prophets. -in One, Holy, Catholic, and Apostolic Church. I confess one baptism for the remission of sins. I look for the resurrection of the dead, and the life of the age to come. Amen. 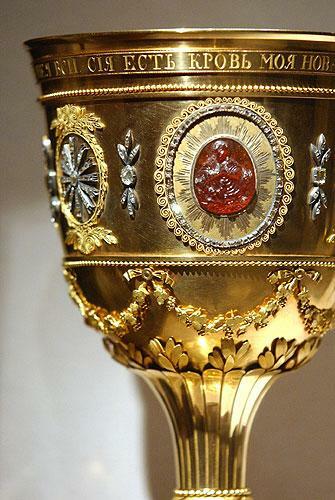 This is the heart of the Eucharistic Liturgy. The word Anaphora means something to the effect of "offering back", and is often rendered into English as The Holy Oblation or The Holy Sacrifice. In it, we lift our hearts and offer our prayers and praise to God, uniting them with Christ's timeless Sacrifice of Himself - his Body and Blood - made truly present with us. Let us stand well; let us stand with awe; let us be attentive, that we may offer the Holy Oblation in peace. Holy, Holy, Holy, Lord of Sabaoth: heaven and earth are full of Thy glory. Hosanna in the highest! Blessed is he that cometh in the name of the Lord. Hosanna in the highest! While the above is sung, the priest continues the great prayer mysticos (in a whisper), and then chants aloud the words of the Lord, in which he declares the bread and wine to be his Sacred Body and Precious Blood. We respond Amen each time. The epiklesis follows, in which the priest asks the Father to send the Holy Spirit to change the Holy Gifts into the Body and Blood of Christ. This is the most reverent point of the Anaphora at which the people prostrate themselves. We now unite our Offering with that of all the Saints, and with all the faithful the world over, commemorating most of all the Mother of God, through whom the Incarnation was made possible. We pray for our bishops, priests, all the clergy, and all the people of God, and for God's mercy to be extended to all people in their various needs, bringing all of creation to share in the redemption and wholeness brought about by Christ's saving work. Our Father, Who art in the heavens, hallowed be Thy name. Thy kingdom come, Thy will be done, on earth as it is in heaven. Give us this day our daily bread; and forgive us our debts, as we forgive our debtors; and lead us not into temptation, but deliver us from the evil one. Christ comes to each of us in his Body and Blood. During this time, various prayers and hymns are offered, and the Communion is followed by some short hymns of praise and a Litany of Thanksgiving. More about the practicalities of Communion may be found in our section for visitors. The Priest says the Prayer below the Ambo and then invokes God's blessing. This ends the Divine Liturgy. The veneration of the Cross, the antidoron and the prayers of thanksgiving after Communion now follow. Generalising, there are two usual forms that Christian worship can take: linear and layered. Linear worship usually achieves a sense of corporate worship by everybody focussing on the same action at the same time, and so everybody says the same prayer together, sings the same hymn together, and so forth. "Be eager to do everything in God's harmony, with the Bishop presiding in the place of God, and the Presbytery in the place of the council of the Apostles, and the Deacons, most sweet to me, entrusted with the service of Jesus Christ." "Each of you must be part of this chorus so that, being harmonious in unity, receiving God's pitch in unison, you may sing with one voice through Jesus Christ to the Father." Movement, colour, taste, smell, and music all come together to join the words, which is why it may perhaps be better for first-time visitors not to tie themselves to a prayer book, but rather to allow themselves to be immersed in the fullness of what is happening. Still, for those who would feel lost without one, there are prayer books available.